Now this is a fun disc. My simple description for this is instrumental space lounge groove music. Dipstick like to mix up beat jazz, ultra twangy guitars, surf, Latin rhythms, and mucho spacey synths, make it unavoidably dancable, and then apply all manner of studio editing treatments to it. Instrumentation includes electric, acoustic, and lap steel guitars, bass, percussion, synthesizers, sampler, turntable, and oboe. Percussion, guitars, and synths are the main actors here and close listening reveals a seemingly endless variety of guitar and percussion sounds that are combined in creative ways to make this a pretty busy glom of cosmically hip shaking pulsations. The disc is only 30 minutes long, but among the highlight tracks is "Candy Apple", which mixes nearly all the styles mentioned above and has lots of cool freaky space synths. "Rosa", "Cobra", and "La Barra del Diablo" are heavy on the Latin rhythms and salsa influences. "Rosa" also has eerie organs, and loud dancey percussion, all mixed and studio mashed into a loungy space groove. "Cobra" is similar, but much more spaced out. And "La Barra Del Diablo" includes twangy guitar and lots of mixology to throw the whole thing enjoyably out of whack. 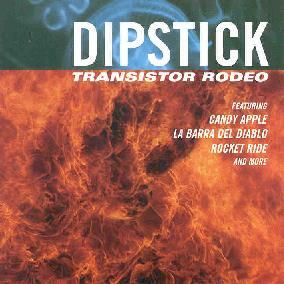 For "Rocket Ride" Dipstick blaze on the guitars and organs for a bouncy bluesy tune. And my favorite track on the disc is "Midnight Molé". The song starts with a brief Robert Fripp type guitar pattern and then veers off into jazzy dance terrain with some of wildest tripped out guitars on the album, which is in addition to the head rattling twangy guitars we've heard on previous tracks. It's got a great catchy keyboard melody too. A Grrr-ooooovy set!!! You can visit Dipstick at their web site. Transistor Rodeo is distributed by WEED Records. You can visit their web site.